First, a big thank you to AppAdvice from which I won this app from ($60 value). It's a great site which I also follow on twitter. Check out their video podcast too. - I already use Navigon on my iPhone which I love and purchased all the in app upgrades too. This is more of a quick impressions since I've only messed around with TomTom for about an hour but drove around 800 miles with Navigon. Navigon recently had a very nice ios 4.0 update so I'll be commenting on that too (fyi, any in app purchases with navigon you can just redownload after you update the app. It's smart enough to know you purchased it before and it will tell you it is downloading again for free). - It's about a 1.5gb download so like navigon all map data is local. This is great compared to other solutions like Google Navigator or the free mapquest iphone app which streams the map data. This means you'll still have a fully functional gps navigation system even in areas with no coverage. - In general I find tomtom has more options, some quite handy, some pretty useless. - Route calculation seems to be a bit slower on tomtom but both do a pretty good job with rarely an odd ball suggestion. I like how navigon shows 3 routes right up front, recommends one but lets you choose. - Flipping between 3d/2d map modes and over view of entire trip takes way too much back and forth menu navigation on tomtom. Navigon does it in a lot fewer actions and just gets you to the most used options and views faster than tomtom. - 3D view graphics are very good on both but I like Navigon a bit better. I think tomtom has a very nice clean look, and it's easy to identify all the import elements. I even like the dots they put on the route so you can see relative movement easier. Navigon looks a bit more busy but I just like the more "realistic" look of navigon (Panorama view 3d enabled). I like how the horizon on navigon reflects the current weather and even the position of the sun. 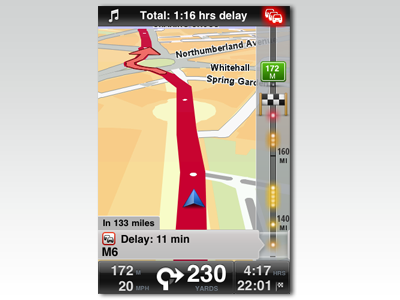 - TomTom has a lot of voice options to choose from where navigon has basically none. So if you want to be bossed around by a british lady you can! Another neat option is the ability to pause your audio instead of just quiet it down while the nav lady speaks. This is handy if you are listening to a podcast/audio book and you don't want to miss anything. Navigon only quiets down the background audio. TomTom has only the standard pause/play,next/previous ipod controls while navigon has a stripped down version of the ipod app built in. This isn't so import since they both support multitasking now. Also, you can play streaming audio apps in the background while using the navigation app say pandora. This works with both tomtom and navigon. The only thing is even in tomtom the option to pause background audio won't work with streaming audio (only the built in ipod player). - Both apps run great in the background. You sill get audio directions no matter what you are doing and hopping back in the app instantly puts you right back in the map at your current location. It works really really well. - TomTom and Navigon integrates google search right into the app for finding a destination. An updated POI database is nice but it's no google. - Traffic option is $20/year which I did not try. Navigon is a $25 one time charge. I HATE reoccurring fees. - Both seems to get a gps lock fairly quickly. - Speed warning is fixed at 5mph which is really annoying. +5mph is my normal driving speed so the alert goes off constantly if I have the option on. Navgion lets you choose between 5, 10, 15, 20 mph separately for urban and non urban areas. I have it set at 10mph which is just right for me. - Both do text to speech pretty well and speak all street names. TomTom is just loaded with options and might be a bit overwhelming. Navigon has a cleaner easier to navigate interface and does all the critical things right. Both are excellent options in my opinion. The annual fee for traffic in TomTom does bug me though. You really can't go wrong with either app but I'll probably be sticking with navigon - better graphics, useful speed warning, cleaner more efficient UI navigation, and no annual fees for any of the options. The only thing I think I'm really going to miss from TomTom is the ability to pause background audio while the nav lady speaks.